After a practice crash last week, Rastrelli fought through the pain and pulled the holeshot in moto one. 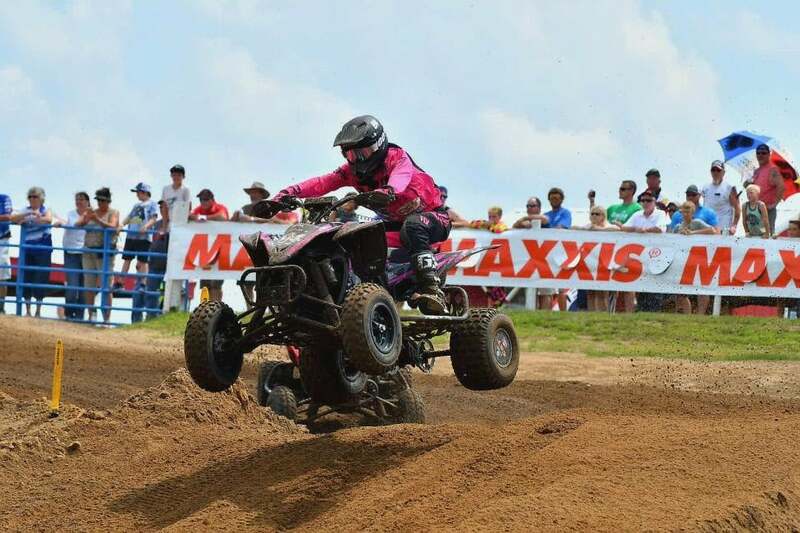 The stage was set this past Saturday at Sunset Ridge MX as round six of the 2018 ATV Motocross Championship (ATVMX) presented by CST Tires, an AMA National Championship, series fired off the gate with high temperatures and humidity that were almost unbearable. This track is called home by Chad Wienen, and history here has shown he has a winning record. However, Rockford Fosgate/Ti-Lube/Honda’s Joel Hetrick had other plans. As racing began, you could tell it was going to be a thriller to see which racer could put together a race that brought them out on top and to the center of the box. As moto one got underway it was Baldwin/Jeff Rastrelli Land Grading/Ford Brothers Racing Honda’s Jeffrey Rastrelli claimed the SSi Decals Holeshot Award. Rastrelli toughed it out through the first moto after injuring himself in a practice crash last week. Both Hetrick and Wienen Motorsports/Yamaha/Maxxis’ Chad Wienen were looking to get around him and into the lead. Wienen made the moves and claimed the lead and the race was on as Hetrick powered his way into second. 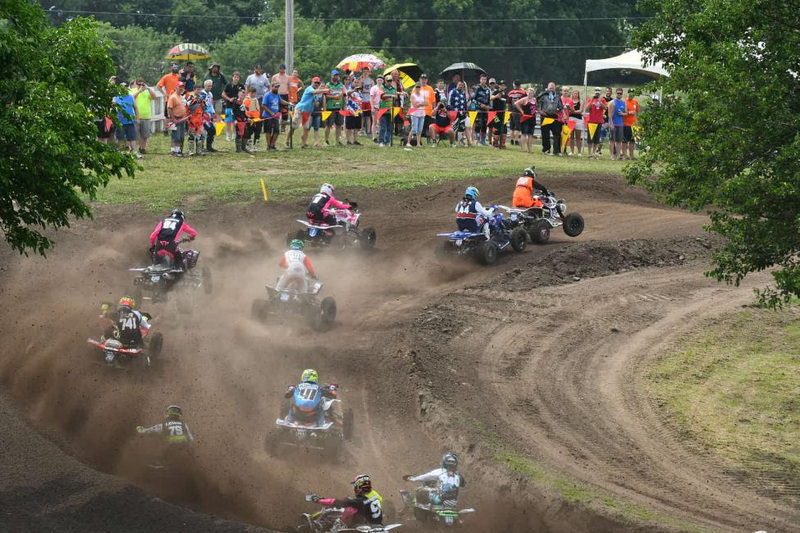 The gap between the leaders grew shorter quickly and soon they were pulling a sizable gap over the rest of the AMA Pro ATV field. Hetrick was pressuring Wienen, but his challenge for the lead would come late in the moto after following the leader for some time and picking up some lines he could use to his advantage not only in this moto but in the second as well. As the laps were adding up and the was clock ticking down as Hetrick made his move and took the lead. Wienen mounted a charge but the pace was intense, and the moto would end with Hetrick taking the win as Wienen tried to save some energy for a showdown in the second moto. Thomas Brown earned third overall at Sunset Ridge MX. Behind the battle for the lead, Tbrown84 Training/CST Tires’ Thomas Brown was stretching out his lead as he held onto the third place position over GBC Motorsports/Hetrick Racing/Walsh Race Craft’s Westley Wolfe. Wolfe was having a great race running in fourth, and with Brown just out of his reach Wolfe would settle into a solid pace and continue to ride smart for his second fourth place finish of the 2018 season. After battling his way to the fifth position, time would run out for GennUSA Racing/CST Tires/Corrosion Specialties’ Nick Gennusa to battle with the front of the pack. Gennusa would remain in the fifth place spot until the checkered flag flew for moto one. Kyler Lenz Motorsports’ Sam Rowe was putting in a one of his best rides thus far in the season, coming through in the sixth position for moto one. Koster Racing’s Wes Lewis was pushing through the pack for one of his best rides of the year as he came through in the seventh place position for moto one. Root River Racing’s Dylan Tremellen finished out the first moto in eighth, with Rastrelli fighting through the pain for a ninth place finish. Rounding out the top ten in moto one was AGR/HEP ATV/Moto Trim’s Drake Koelling. Wienen would finally take the position away from Brown, however, the opportunity to run down Hetrick was fading fast. With energy spent and time running short, Hetrick would claim the moto two win with Wienen and Brown finishing 2nd and 3rd respectively. Wienen said, “I felt a lot stronger in moto two, but I took longer to get going and that cost me.” The win by Hetrick gives him command of the Pro points battle by three as we head into the later parts of the season. 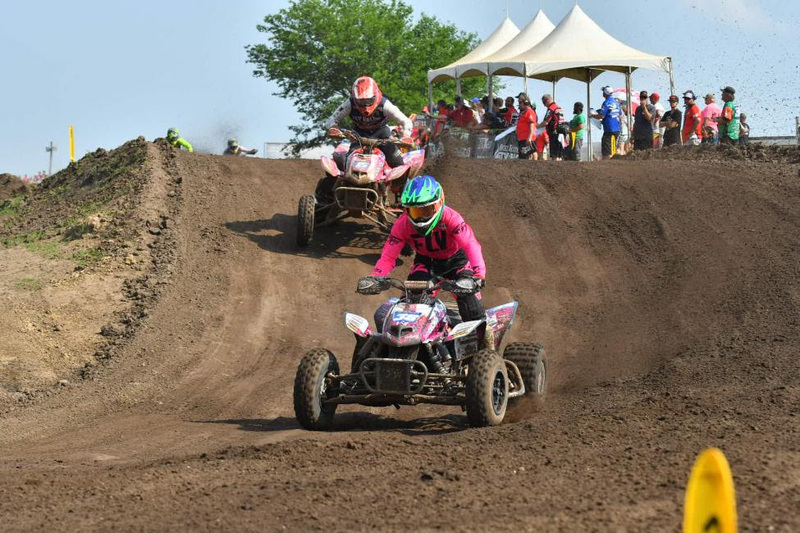 Sam Rowe and Nick Gennusa both put it good rides at the ATVMX National in Illinois. Gennusa would step up a position in moto two taking away the fourth spot, earning a fourth overall on the day. Rowe followed with a fifth place finish, after an exceptional race at Sunset Ridge going 6-5 for fifth overall. Another Illinois native, JH Racing/Walsh Race Craft/SSi Decals’ Zachary Kaczmarzyk came away with a sixth place finish in moto two to earn a ninth overall at his home state track. Lewis would come across in the seventh place position once again earning sixth overall, which is his best finish thus far. Wolfe would not have the second moto results he hoped for after such a great race earlier in the day. With moto finishes 4-12, Wolfe would finish seventh overall. Tremellen finished eighth overall with two eighth place finishes at Sunset Ridge. Koelling came through in ninth overall after a finishing score of 10-9. Just missing the top 10 overall was Rastrelli with moto finishes of 9-10 on the afternoon. 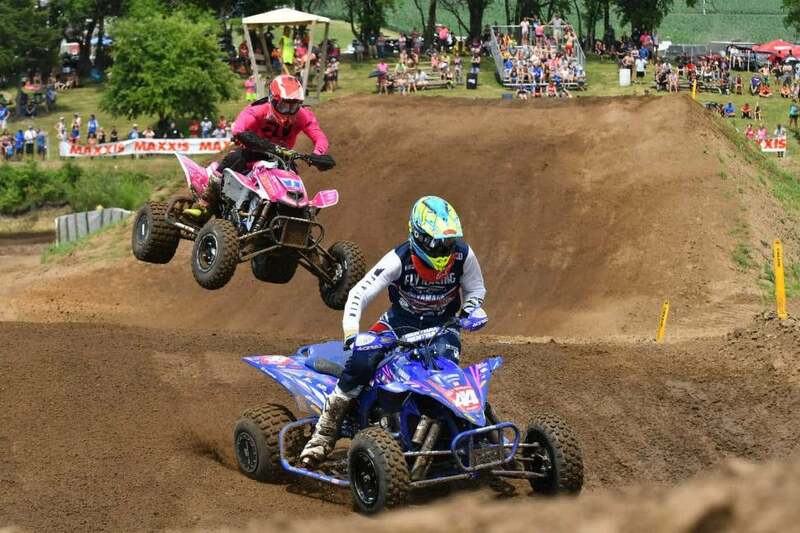 Joel Hetrick (center), Chad Wienen (left) and Thomas Brown (right) rounded out the overall podium at the Sunset Ridge ATVMX National. 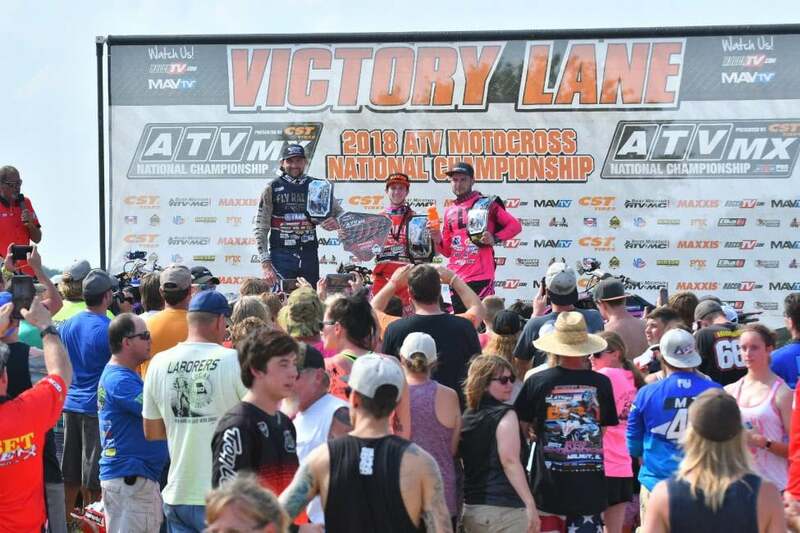 The 2018 ATV Motocross National Championship (ATVMX) returns on Saturday, July 7th for the Unadilla ATV Motocross National in New Berlin, New York.